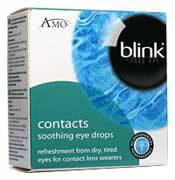 Blinking is the eye`s own natural way of replenishing the tear film. Use blink™ Contacts to lubricate and rewet soft and rigid gas permeable (RGP) contact lenses as well as to cushion lenses prior to application. For lubricating and rewetting of soft and rigid gas permeable contact lenses and to help relieve dryness, discomfort and irritation that may be associated with lens wear. Be the first to write an online review of Blink Contacts (Vials) and share your thoughts on this product with other shoppers!